As many as 160 overseas Vietnamese students on a visit to their homeland for a Vietnam Summer Camp arrived in central Da Nang city on July 21. 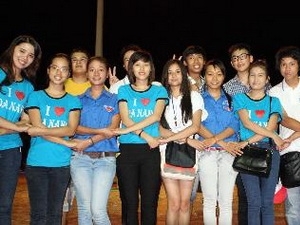 The young OVs and Vietnamese peers at the exchange in Da Nang city. The students visited My Khe beach and several famous sites in the city. On the same evening, they joined 400 youngsters from the city for an exchange designed to promote the bond between overseas Vietnamese students and domestic youths. Themed ‘10 years – The call of the homeland,’ the 2013 Vietnam Summer Camp began in the northern mountainous province of Ha Giang on July 14. Jointly organised by the State Committee for Overseas Vietnamese Affairs and the Foreign Ministry since 2003, the annual event creates an opportunity for pupils and students residing in countries over the world to better understand their home nation’s history and culture. This year’s event is leading the youths through nine provinces and cities across the country. It will end on July 30 in the southernmost province of Ca Mau.